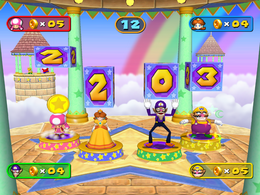 Cointagious is a 4-player coin collecting minigame in Mario Party 7. Its name a pun on the word "contagious". The screen zooms in on the four players. In this minigame, the main goal is to just collect as many coins as possible. For twenty seconds, the players hit Dice Blocks that roll from zero to three. The number that appears on the dice block when rolled is how many coins are received. There is no winner in this game, as, regardless of how many coins are received by the end of the game, everybody still walks away with something, unless they didn't get any coins at all. All players who got coins do their victory animation. Rules – "Hit the Dice Block to earn the same number of coins as the number rolled." Advice – "You can hit the Dice Block many times. Jump, jump, jump!" This page was last edited on January 30, 2019, at 11:24.